Home / Archive by Category "Community Service Committee"
Make use of your community service leave benefit by getting involved with local nonprofits. UNC permanent employees can use up to 24 hours of work time per calendar year to volunteer with a nonprofit organization. The 18th annual Public Service Fair is 11 a.m. – 2 p.m. Wednesday, Sept. 20 in the Pit. This is a great opportunity to connect with more than 20 local nonprofits and find ways to make a difference in our community. Click here to see the full flyer. Since December 2016, the Carolina Center for Public Service has partnered with the North Carolina Conference of the United Methodist Church (NCCUMC) to support Hurricane Matthew disaster relief efforts in Princeville, Lumberton and Fayetteville, North Carolina. In June, NCCUMC launched its Adopt-a-Home program to help displaced families in Lumberton. Organizational partners are needed to help get families back into their homes by volunteering labor and providing donations to purchase furniture, appliances and home furnishings. Join NCCUMC, 9 – 10:30 a.m. Wednesday, Sept. 20 in the Frank Porter Graham Student Union, room 3503 for updates on Hurricane Matthew’s devastation, recovery efforts-to-date and details about the Adopt-a-Home program and the process for adopting a family. Register through UNC event registration. Celebrate Carolina Cupboard’s Grand Reopening! 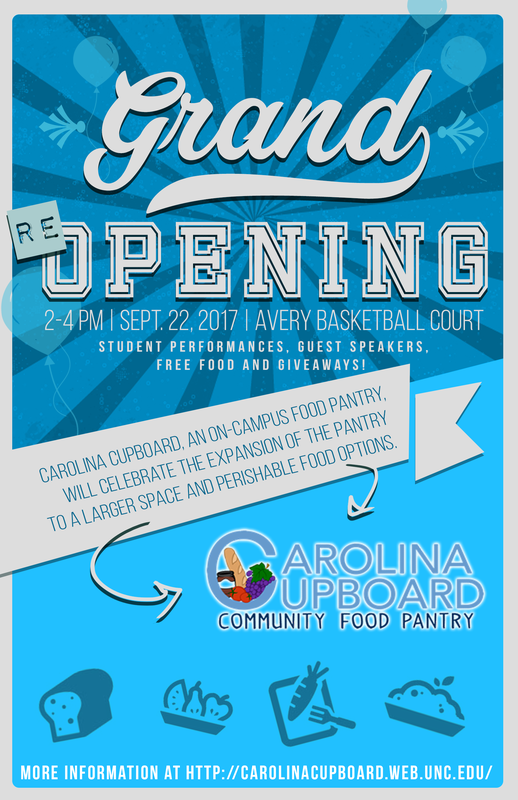 Carolina Cupboard, an on-campus food pantry, will celebrate the expansion of the pantry to a larger space with perishable food options. For more information, please visit http://carolinacupboard.web.unc.edu/ or click here to see the full sized flyer. Orange County Solid Waste Management hosts recycling and waste diversion activities at most large special events in Orange County. Recycling volunteers comb event grounds making sure recycling collection is maximized and moving smoothly. We work hard but we have fun, so share these opportunities with your friends and family! Carrboro Music Festival Saturday Sept. 23, 2-6PM, Town Hall Pavilion (only 2-3 slots needed). Sunday, Sept. 24, is the BIG DAY, shifts 1-4:30PM, and 4:30-8PM. Music all over town, SUPER FUN. We need tons of help on Sunday. YepRoc20 Hillsborough-based YepRoc Records celebrates 20 years in the business with a great musical line-up and beer at beautiful River Park. Saturday, Oct. 21, shifts 11AM-3PM, 3PM-7PM. Three slots available for each shift. Volunteers enjoy the jams while they collect the cans. It is no surprise that the Carolina community is responding in important ways to the immediate needs for relief in the aftermath of Hurricane Matthew, Hurricane Harvey, and now Hurricane Irma. The recovery period for affected communities is long and will span years. In addition to donating money and volunteering with established groups working with affected communities, there will be additional ways to help in the coming weeks and months. Periodic updates will be shared through the Carolina Disaster Relief listserv. To join the listserv, send an email to ccps@unc.edu. If you are aware of disaster response or recovery efforts being coordinated on campus, or if you are organizing efforts to help, please send an email to ccps@unc.edu. The websites ccps.unc.edu/HurricaneMatthew and ccps.unc.edu/HurricaneHarvey are regularly updated and contain information about Carolina’s efforts and other information and resources. As we approach one year since Hurricane Matthew devastated eastern North Carolina and as we continue to see the impacts of Hurricane Harvey, please consider volunteering for relief efforts. The Carolina Center for Public Service is organizing campus-wide relief trips to continue the rebuilding process after Hurricane Matthew in Lumberton, North Carolina. These trips are for UNC staff, faculty and students who are willing to help with clean-up or who have specialized building and repair skills. Trips are scheduled for Friday, Oct. 6 and Friday, Dec. 1. For details, FAQs and registration forms, visit UNC disaster relief trips. Have you utilized your community service leave? Have you or your department otherwise served the community or volunteered in other ways? Send a picture and a short blurb (300 words or less) about your experience and what you’ve gained from using your leave, and we’ll feature you here! Email submissions or questions to Katie Musgrove at kmusgrov@email.unc.edu. Mark your calendars: UNC Employee Forum sponsored Habitat for Humanity build! The Employee Forum and other staff groups across campus will sponsor a build day for Habitat for Humanity in early April 2017! The home being built in Chapel Hill’s Northside neighborhood will be gifted to a UNC Staff member, Thein Oo and his family. More information on the time and date of this event will be coming soon! Community Service Leave will be available for this event with prior supervisor approval. For more information on Community Service Leave, please visit http://hr.unc.edu/policies-procedures-systems/epa-non-faculty-employee-policies/leave/community-service-leave/. 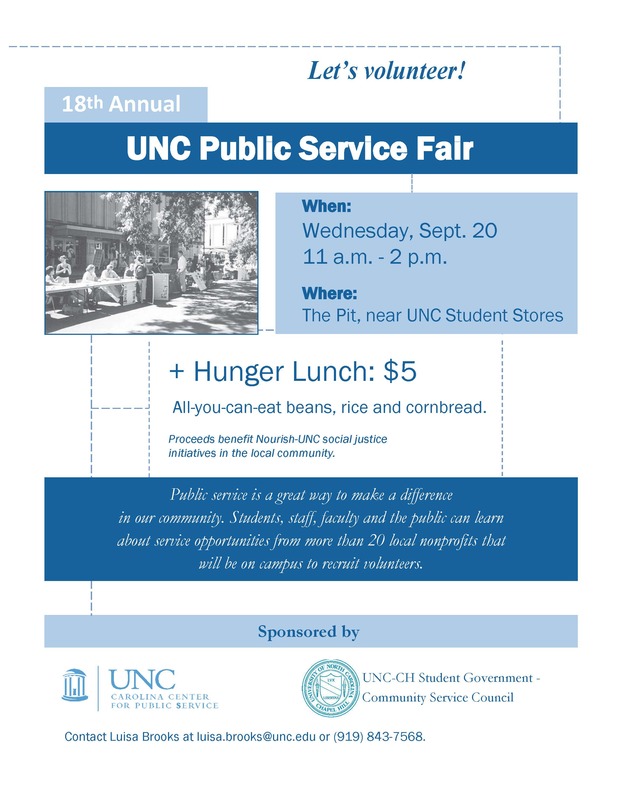 If you or a group of individuals in your department or unit wish to participate, please reach out to Heather Lewis (hlewis22@email.unc.edu) for more information. Please support the Caring Community Foundation by participating in the Caring Community Walk/Run 5K, which is organized by Kappa Epsilon (KE), a UNC Eshelman School of Pharmacy (ESOP) organization. The 5K will start at the Old Well at 7:30AM on March 25th and run through UNC’s campus. The Caring Community Foundation was founded by an ESOP and KE alumni and works to raise money to help cancer patients with their everyday expenses. More information about the organization can be found at their website, caringcommunityfoundation.org. Please go to runsignup.com/Race/NC/ChapelHill/KECaring5k to register for the 5K. Registration is $25 and includes a t-shirt. As communities across eastern North Carolina deal with the aftermath of Hurricane Matthew, efforts continue at Carolina to aid in many aspects of recovery. Individuals and groups of staff, faculty and students have already made several relief trips. The Carolina Center for Public Service, together with the university’s campus and community partners, is organizing relief trips for staff, faculty and students who are willing to help with clean-up or who have specialized building and repair skills. Upcoming relief trips are March 17, to Kinston, North Carolina, April 21 to Tarboro/Princeville, North Carolina and May 19 to Lumberton, North Carolina. For details on what to expect and information on completing forms, visit UNC Disaster Relief Trips. contact information (email and phone number). 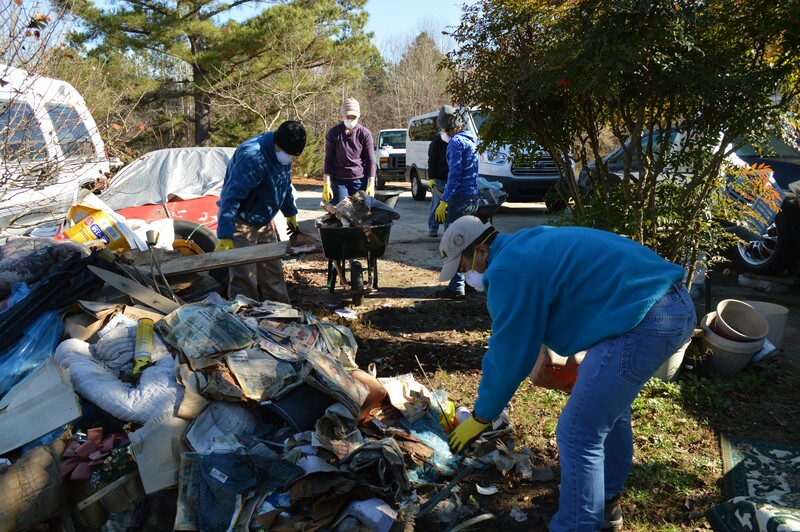 Mary White of the Health Sciences Library utilized Community Service Leave to volunteer with the Carolina Center for Public Service’s disaster recovery trip to Tarboro, NC on December 9, 2016. She has also worked in disaster response over the past 5 years with the North Carolina-1 Disaster Medical Assistance Team and the Northeast North Carolina Medical Reserve Corps unit. “As an undergrad at UNC-CH, I volunteered with the Town of Chapel Hill for Hurricane Floyd recovery efforts over 17 years ago, in Speed, NC, a little town in northeast North Carolina. After Hurricane Matthew hit, I saw the Carolina Center for Public Service trip to Tarboro and Princeville, NC, two towns near where I originally volunteered. I immediately signed up, and was delighted to join faculty, staff, and students to travel “out east”. My family is from northeast North Carolina, so it was quite meaningful to go there to help out. “We connected with the community through the local Methodist church, whose parent organization has a substantial disaster response unit, drawing volunteers from as far away as Canada. Our group worked at two houses. At one, we helped a gentleman move furniture from his house, so that he could repair and replace flooring and walls affected by the floods. At the neighboring house, we helped to move the contents of the house to the roadside, to be picked up later by trash haulers. The Ronald McDonald House of Chapel Hill is always seeking volunteers to help their families feel more at home both at the House and at the hospital! Whether you are available once a week or once a year, they welcome any and all assistance. This is also a great opportunity for UNC departments who may wish to gather a group of Staff/Students/Faculty to volunteer as well! For more information on how to volunteer with this great organization, please visit http://rmh-chapelhill.org/get-involved/. The Carolina Center for Public Service, together with the campus and community partners, is organizing campus-wide relief trips to areas affected by Hurricane Matthew. These trips are for UNC staff, faculty and students who are willing to help with clean-up or who have specialized building and repair skills. If you would like to receive updates on future relief trips, email ccps@unc.edu. The Jackson Center is a nonprofit oral history and community development center located on Rosemary Street which works primarily in Northside and Pine Knolls, two of Chapel Hill’s historically black neighborhoods. Heavenly Groceries/Comida Celestial, the food pantry that the Jackson Center partners with, is in desperate need of volunteer support during UNC’s winter break. Volunteers staff the following shifts every weekday: van driving (2:15p-3:45p), van unloading (2:30p-4:00p), and food distribution and cleanup (3:45p-5:15p). If you are willing to volunteer for a day (or more!) over break or want more information, please contact William Page at william@jacksoncenter.info or visit www.jacksoncenter.info/volunteer/ to create an account and sign up for volunteer shifts. The Carolina Center for Public Service, together with the campus and community partners, is organizing campus-wide relief trips to areas affected by Hurricane Matthew. These trips are for UNC staff, faculty and students who are willing to help with clean-up or who have specialized building and repair skills. If you would like to receive updates on future relief trips, email ccps@unc.edu. As communities across eastern North Carolina deal with the aftermath of Hurricane Matthew, efforts continue at Carolina to aid in many aspects of recovery. Individuals and groups of staff, faculty and students have already made several relief trips. The Carolina Center for Public Service, together with campus and community partners, is organizing campus-wide relief trips to affected areas. These trips are for UNC staff, faculty and students who are willing to help with clean-up or who have specialized building and repair skills. 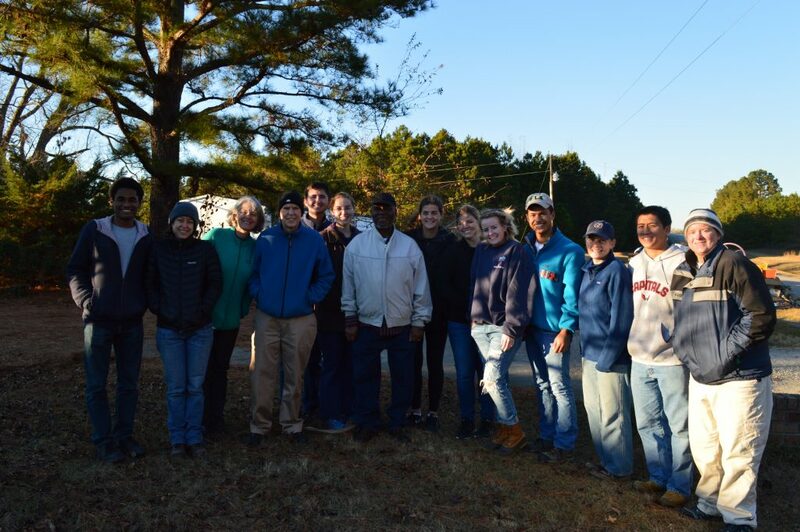 The first relief trip is Friday, Dec. 9 to Tarboro, North Carolina. For details and to register, visit UNC Disaster Relief Trips. If you would like to receive updates on future relief trips, email ccps@unc.edu. The best source of updated information is posted on a dedicated website at ccps.unc.edu/HurricaneMatthew. The center will continue to collect and share information about relief efforts. Please send information about additional opportunities to ccps@unc.edu. Challah for Hunger is an organization that bakes challah bread and sells it in the Pit the next day, with all proceeds going to local and international hunger relief organizations. Volunteers are needed to bake the bread and sell it in the Pit. The challah is baked at North Carolina Hillel on West Cameron Avenue and all are welcome. To volunteer, sign up online. For questions, contact Jessie Winfree. The Employee Forum is hosting a ‘Food for All’ Campus-wide Food Drive from October 8-21, 2016. We are partnering with UNC General Alumni Association in celebration of their annual Tar Heel Days of Service to host a food drive benefiting the Food Bank of Central & Southeastern NC and UNC’s Carolina Cupboard. Boxes will be distributed throughout campus over the length of the drive, but we will also have special booths for donations at the start and end of the drive – (1) the Employee Appreciation football game versus Virginia Tech on October 8th and (2) Employee Appreciation Day celebration on October 21st. At the finale, you will have the chance to win a prize if you guess the amount of food donated throughout the course of the drive! Please be on the lookout for more details regarding the Food Drive in the coming weeks! The Employee Forum has created a new committee, the Community Service Committee, to help promote UNC staff community service efforts. This committee, in coordination with members of Carolina Center for Public Service, Carolina Union Activities Board, and other campus organizations, will host various community service events throughout the year, similar in nature to the annual Carolina Blood Drive that is currently hosted by the Employee Forum each year. The committee will also advertise various other ways in which UNC Employees can participate in community service throughout Chapel Hill and the wider North Carolina community and use their community service leave. In creating this new committee, we at the Employee Forum strive to fulfill the University’s Mission to “serve North Carolina, the United States, and the world through teaching, research, and public service” and also to “improve society and to help solve the world’s greatest problems.” This committee will help to ensure that we as employees of the University of North Carolina at Chapel Hill seek to foster an active and engaged commitment to our University and our wider community. The more people we have helping us, the better we can do in establishing the UNC Faculty/Staff Community Service Initiative and hosting various community service opportunities through the Employee Forum! Please keep in mind that you do not have to be on the Employee Forum to serve on a committee! Even if you are just interested in helping out at the various events we plan throughout the year, that is also much appreciated. Every little bit helps. If you are interested in signing up for the committee listserv or helping us out in any way, please email the Chair, Katie Musgrove at kmusgrov@email.unc.edu.